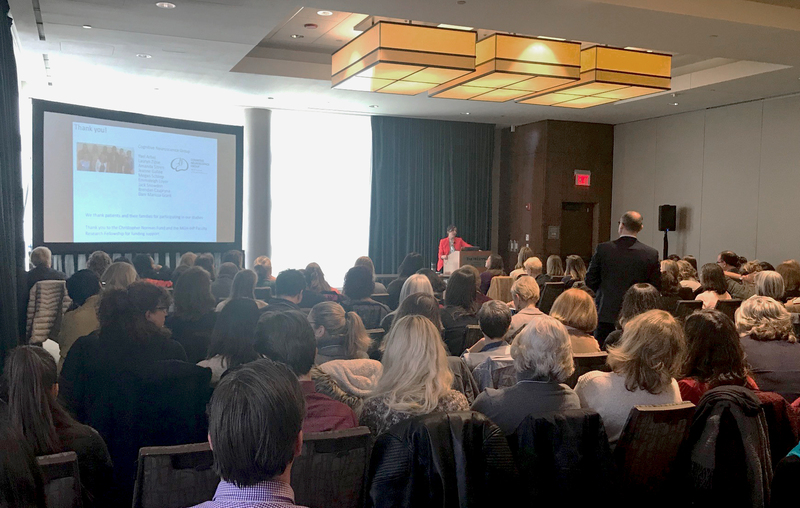 The 2018 ANCDS Annual Scientific Meeting was our best-attended meeting ever! With over 150 attendees, we had an outstanding day of learning in Boston. This year’s theme was Advances in Neurological Rehabilitation, and our speakers addressed a wide range of exciting new ideas and tools that are both currently available and under development. The morning sessions addressed issues surrounding aphasia recovery. First, Dr. Swathi Kiran, of Boston University, addressed the topic of functional reorganization of the language system in aphasia, with an eye toward predicting recovery prognosis and trajectory for individuals. She presented a theory of recovery in chronic aphasia that merges the influence of an individual’s neurological profile with their language / cognitive and social / functional profile to allow accurate prediction. In addition, she reported on data being collected from users of Constant Therapy aphasia treatment apps. Data from nearly 80 million exercises completed are confirming that people with milder impairments make more improvement, and that more treatment trials are needed for individuals with more severe impairments to make the same degree of improvement as those who are less impaired. This is consistent with both common wisdom and smaller studies in aphasia rehabilitation, but confirmation from such a large data set is novel and exciting. The second speaker, Dr. Sofia Vallila-Rohter, focused on the role of learning in aphasia rehabilitation. She emphasized that learning is critical to language recovery, as well as to using technology to support communication. Therefore, being able to identify and understand the types of learning that support these tasks may be an additional useful way to choose the most appropriate treatment methods for a particular client. She and her research lab are doing work to further understand the roles of both explicit and implicit learning in aphasia, with initial results indicating that typical adults and people with aphasia show differences in how they learn. Stay tuned as this work develops further! For the afternoon talks, the presentation topics turned to motor speech disorders. First, Dr. Cara Stepp addressed a new understanding of the nature of speech motor impairments in Parkinson’s Disease, along with developing research on assessment and treatment of this population. Her current research suggests that part of the problem is with managing and integrating feedback during speech production. In terms of assessment, visual analog scales have been found to be a reliable alternative to time consuming transcription measures. For treatment, she reported on data that indicate that treatment focused on increasing vocal intensity is effective, though effects may be small, and that gains can be expected to be maintained over time. In the last talk of the day, Dr. Jordan Green discussed a wide variety of issues surrounding assessment of motor speech disorders in a range of populations. From earlier diagnosis of motor speech impairment in ALS to differential diagnosis of PPA, to improving speech production following face transplantation prolonging oral communication abilities in people with oral paresis, his presentation was a fascinating walk through the complexities of diagnosis and treatment of speech motor disorders, and the potential roles of technology in tackling these issues. On behalf of ANCDS, I would like to thank our speakers for their lively, interesting presentations and those who attended the meeting for the discussions that ensued. This meeting always manages to bring new ideas to light in interesting, clinically relevant ways, and this year was no exception. Particular thanks are also due to the Education and Standards Committee, who organized and pulled off the entire event: Melissa Duff, Mike de Riesthal, Louise Keegan, Gail Pashek, and Erin Bush. In addition, Mike Biel handled all of the tech needs for the day and is preparing the recordings so that they will be available online for continuing education credits. Thanks are also due to Megan Caldwell for managing all of the requirements and paperwork to allow everyone who attended (or who watches the archived version) to receive ASHA CEUs. And kudos to the team at our management firm, ADS, who managed the website for the meeting, registration, and a million little necessary details. This meeting is the highlight of the ANCDS year and it definitely takes a village!